Students at University College Cork have won a global electronic engineering competition for a project that uses smart technology to monitor the plight of honey bees. The smart beehive can autonomously track the activity of the bee colony and conditions within the hive. Honey bees play a fundamental role in maintaining food supplies, and are considered the most important pollinator in food production. Yet colony numbers are in dramatic decline in many places, as a result of factors such as growing human populations and climate change. So a group of students from UCC have created a monitoring system to track what is going on inside the bees' home and develop a path to halt their decline. 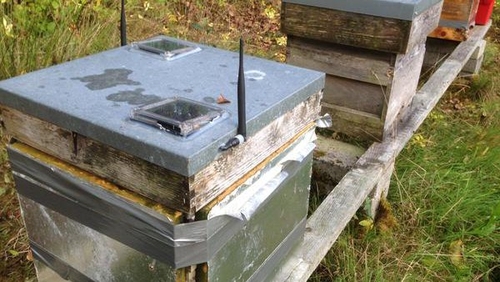 It uses sensors, connected via a wireless network to the cloud, to gather and then analyse variables such as temperature, humidity, oxygen, CO2, dust and pollutants inside the hive. The pilot also runs on solar panels, making it energy neutral and fully autonomous, allowing monitoring at all times and all weathers. The project, dubbed 2B or not 2B, has won the Smarter Planet Challenge competition. Run by the Institute of Electrical and Electronic Engineering and IBM, it is the second time students from UCC have won the contest in the last three years.